The Appy Studio is our new tool which allows you to create and send beautiful digital Announcements, Save The Dates, Invites and Thank You’s to your guests. Everything you need for before, during and after your celebration. There is no limit to how many layouts you create. All versions are saved to be available to email or download and share via messaging or social media. Appy Studio is included with all Appy accounts and can be accessed from your Dashboard menu under EMAIL and then APPY STUDIO CARDS. Have fun! The possibilities are limitless! Stock templates utilize your Appy theme font and design to provide a cohesive look for all your communications. 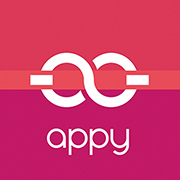 We're constantly adding new templates, so give us a shout out at creative@appycouple.com for your suggestions and feedback. We've included an eclectic collection of graphics you can add to accent your design to create some more drama, fun or just gorgeousness. Graphics are included in Gold Foil, Silver Foil, and standard White--each can be customized to your color choice. Just select the graphics and click on the color icon on the top toolbar. Yes, you can upload any graphic of your choice as well. We support JPGs and PNGs. Not a typographer or not sure what wording to use? No worries, we have that covered. Just drag and drop from our library of pre-made text blocks which you can colorize, change the content, sizes and modify to suit your needs. Look like a pro with no effort at all. When you launch the Appy Studio, the system automatically loads your Appy theme template into the card designs. You can, however, override this at any time without starting over or losing your changes. Just select from one of our Stock Backgrounds and click to apply OR upload you own OR use revert back to your Appy Design. The layouts tab is where you create your design. Choose from existing stock templates (matching your theme) or select a blank canvas to customize your text and images. You can customize fonts, colors, sizes, positions, add graphics, use stock images. SAVE. SAVE. SAVE: Remember to SAVE your changes, you can always go back later to the draft you saved or save multiple versions of your layout. The design you create is saved as an image, which is the main component of your email sent to guests. When using stock templates, please check your content and any placeholder text - remember that you have the ability to edit all the information and styles. The compose tab is where you can add additional text and call-to-action buttons. Once you have a Layout that you are pleased with, proceed to the COMPOSE tab to add a personalized message, call-to-action buttons and a link the invitation to your website. This content is included below your Layout image. The Contacts tab is where you select the recipients of your email. Contacts details are automatically pulled in here from your Appy guest list. You have additional options to filter your list, add an email (where missing) or edit guest names. Changes made to a guest entry here are updated on your guest list simultaneously. The final review step before sending your invite.